Hiya peeps!! Are you guys still reeling from the amazing release we had yesterday? I know I am!! This was another fantastic Paper Makeup release and today I have another fantastic Makeup 4 the Weekend challenge for you coming to you from the incredible Michelle Van Patten!! 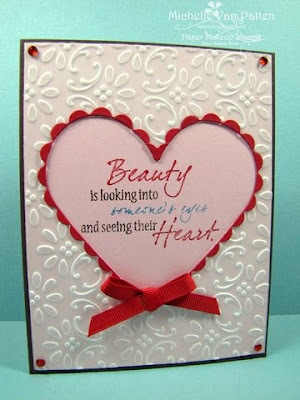 This weeks challenge is to use vellum on your creation!! Can we say W-O-W?!! There is nothing about this card that I don't absolutely LOVE and that embossed vellum is genius!! Fabulous job Michelle! !